Another fun game for the holidays! Head over to get this Soggy Doggy Board Game for ONLY $14.88! Who will get soaked first? 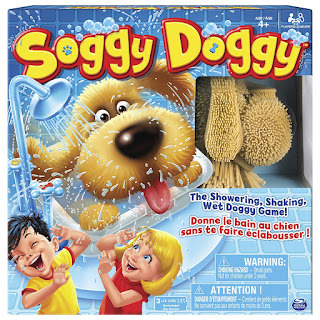 Find out when you play Soggy Doggy, the showering, shaking, wet doggy game! Move your players around the board and take turns bathing this pup. But be careful! He loves to shake himself dry. If Soggy Doggy shakes all over you, wipe yourself off and head back to the start. The first one around the board wins! This anticipation-filled game of splishy splashy fun is great for kids and adults alike. So gather the family and get ready for a hilarious and exciting time with Soggy Doggy!